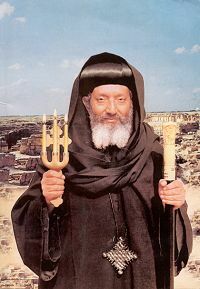 A 20th century Coptic Orthodox saint, the late Bishop Mina AvaMina (born Soliman Rizk on 23 January 1923) was the close disciple and private Deacon of Pope Kyrillos VI. He was also the abbot of St. Mina Monastery in Mariut, Egypt, from 1972 till his departure in the Lord on 11 December 1996. God gave Abba Mina Ava-Mina the gift of prescience for he knew who was coming to see him, their needs (before they said a word) and God's answers to them. He also knew the time of his departure.